"Human Practices is the study of how your work affects the world, and how the world affects your work." — Peter Carr, Director of Judging. If we would like to know how our work affects the world, we will have to LOOK outside. But if we would like to know how the world affects our work, we will also have to STEP outside. Since our project focuses on solving practical environmental issues, besides wet-lab experiments, it is of vital significance for us to integrate the opinions of stakeholders and public citizens into our project. This year, with COMMUNICATION, ECONOMIC BENEFITS and RESPONSIBILITY as the cores of our integrated human practices, we tried to shape and improve our project in a more comprehensive way. For example, through interviews with professors and company employees, we got a clearer view of the project orientation, and the feedback of a Petrochemical Corporation gave us inspiration to improve our hardware. The practical situation and problems caused by biofilm and rust promotes us to find out the most serious aspect of this issue, which turns out to be whether one method can produce economic benefits, or has the potential of doing so. What’s more, the questionnaire we distributed gave us insight into the public concerns and suggestions. Outstanding and successful integrated human practices activities always consist of two parts, meaningful standing points and reasonable methods. The former can help you understand WHY you’ll have to carry out integrated human practices activities, while the latter can give a hint on HOW you can make your core points come true and WHAT you can do to arrive at the destination. As is illustrated in the figure, we have three standing points for our integrated human practices activities. Communication helps us hear others’ comments on our project, on bioremediation, and even on synthetic biology. 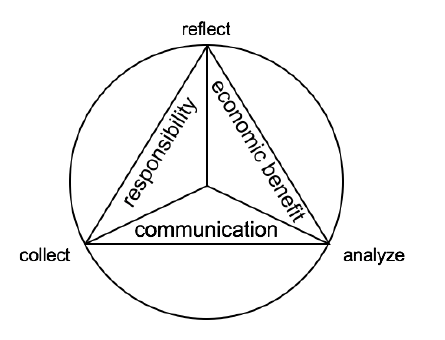 Economic benefit and responsibility are two different but equally important aspects of one project, enabling us to improve our project from varied angles. After discussion with team members and supervisors, we set the “collect – analyze - reflect” working cycle to keep improving the project and our thoughts. 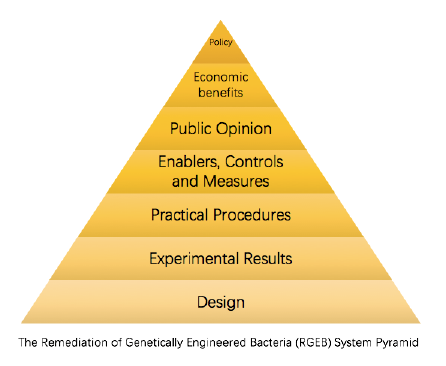 There are always many factors to be taken into consideration when working on bioremediation projects, so we designed a pyramid diagram containing main factors and procedures for a project on remediation of genetically engineered bacteria (RGEB). The lower 3 layers put emphasis on practical design on experiments and the upper 4 layers address the importance of social influence. For a given project on bioremediation or trying to solve practical environmental problems, how can we evaluate its effect? To which aspects should we pay attention to? What kind of comments should we use if we would like to draw a conclusion? Iron Guardian designed a simple but practical diagram to answer the questions above. As is shown in the diagram, we are looking for ideal solutions with both high responsibility and economic benefits, but most solutions at present are unsound, unpractical and even unsafe. 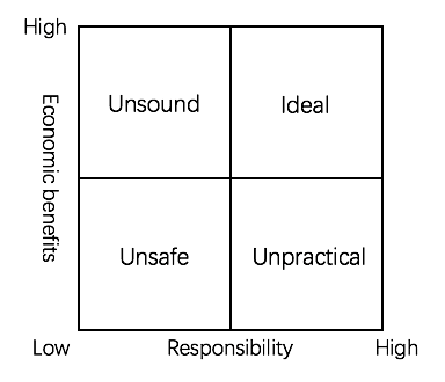 The diagram itself is quite simple, but it provides a practical angle for evaluation, and future can replace the X or Y axis with their own considerations or make it a multidimensional one to evaluate any solutions given. Integrated Human Practices showcases how the world can affect your work, but before the world can have any effect on our project, the very first thing we should do is to hear what the world is saying, that is why we paid special attention to communication, both internal and external. 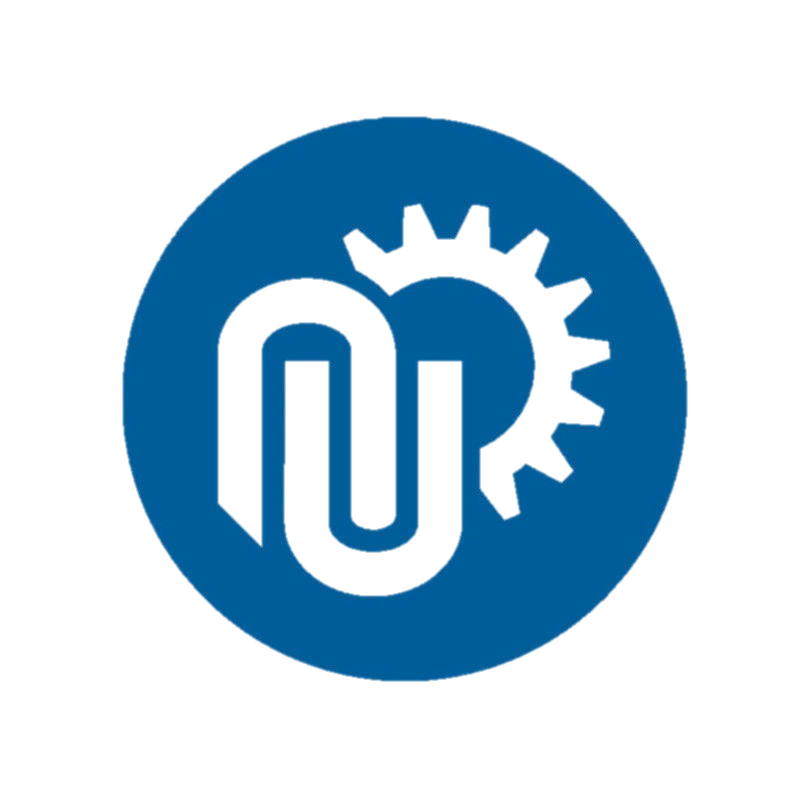 The internal communication with our team members and other teams under the same track, the external communication with experts in different fields and workers in related industries, and the data we collected via reports, literature and field research, all pointed to two important aspects of our project, the improvement of hardware and the economic benefit. During the experience interviewing and collaborating with a Petrochemical Corporation, we displayed our hardware and software, which was able to predict corrosive degree based on neural network configuration. After discussing with the workers and knowing more about their practical needs, we found that, apart from predicting the proper time to drop the bacteria, to monitor the water quality with parameters such as dissolved oxygen or pH was also an important part for factory. So we adjusted the hardware design, added 4 sensors (Industrial pH sensor, ORP Sensor, Electrical Conductivity Sensor and Temperature Sensor) to collect related data, and modified the software interface to match the new design of our hardware. Besides, based on the data we collected, we found that one of the most important issues caused by biofilm and rust in cooling water loop was the exceedingly high usage of water, chemical and energy. Take power plant as an example, the bio-fouling and rust may lead to lower efficiency, higher temperature, more expense on operation and maintenance and so on. By applying bio-control approach for one year, we can get a 56% reduction of water assumption, or 40 million gallons, a temperature drop of 6~7 Celsius degrees, 31,000 pounds of chemicals saved, 10% increase in power plant load, or 20 megawatts, and overall savings of 34 million dollars for just one power plant. Not to mention the design can also be applied to industries such as semiconductor, agriculture, oil refineries and so forth, during which our project will present the great potential of economic benefit. What’s more, ECUST didn’t forget to take responsibility into consideration. We conducted a survey on public opinions about bioremediation, tried to explain our project and adjust our design according to public concern.